Hassanal Abdullah, a poet, novelist, critic, translator and the editor of the International Bilingual Poetry Journal, Shabdaguchha, is the sonnet form innovator: seven-line stanza and abcdabc efgdefg rhyming scheme. He also wrote a 314-page epic on the Universe and how life is connected to it as a whole. He frequently used almost all the major scientific theories and evolutionary understanding in completing the epic. Though he was born in Gopalgonj, Bangladesh, he spent the first three years of his very early life in Khulna, where his father, Nawsher Ali Miah, was a business man. Since he was killed in 1971, during the war between Bangladesh and Pakistan which liberated Bangladesh after nine months of bloodshed and 3 million casualties, Abdullah’s mother had to move to her father’s village in order to survive with three children: Abdullah and two daughters. Hassanal went to the village High School and graduated from there with distinctive result. There, he also penned his very first poem, when he was in 8th grade with the influence of his house tutor. In the village, he also experienced farming, fishing, home building, plowing and all sorts of rural dueling that reflected his writing in the later age. As a student of Rajandra College, in the City of Faridpur, Bangladesh, he continued his writing, which has later flourished while studying at the University of Dhaka. He is the author of 36 books including 16 collections of poetry and Breath of Bengal (CCC 2000), Under the Thin Layers of Lights (CCC 2015), and Swatantra Sonnets: A Bilingual Edition (Feral Press and CCC, 2017), published from New York. 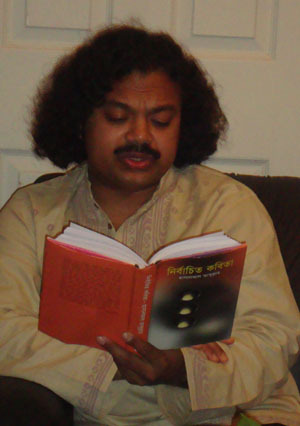 Shabdaguchha, an International Bilingual Poetry Magazine, founded and edited by Hassanal Abdullah since 1998. He was a 2007 honorable mention of the Queens Borough, New York, Poet Laureate. On May 4, 2007, in a citation given to the poet, the Queens Borough President, honorable Helen Marshall, wrote, "As a prolific poet and editor of the English Bengali Quarterly, Shabdaguchha, you have built a solid bridge between poets from East and West, here in the most multi-ethnic county of the world." While in Dhaka, he was involved with Khalaghor, Fulkuri, Shaplakuri and started contributing to the supplements of the Daily Shangbad, Daily Bangalar Bani, Daily Khabor and magazines like Shisu, Fulkuri etc. At this time he also founded a literary organization, Latapata. First of all, it was started for the children of the village he was from, and then it got some ground in the capital of the country. He also founded a library for the villagers. Later he started contributing to the literary supplements of some renowned Daily's such as Daily Ittafaq, Daily Jugantor, Daily Banglar Bani, Daily Dinkal, Daily Bhorar Kagoj, Daily Ajker Kagoj etc. Mr. Abdullah participated in many reading in the tri-state area as a feature poet, including such venues like Barnes and Nobles, Borders Books and Lincoln Center Outdoor Events etc. He was nominated for the 2008 Pushcart Prize. In 2016 The Seventh Quarry, a Welsh based poetry magazine published an interview of Hassanal Abdullah with his sonnet translation. In 2016, at the International Silk Road Poetry Festival in the Szechuan Province, China, he was awarded the Homer European Medal of Poetry & Art. He also received the Labubhai Foundation Award in 2013 for the sonnet form innovation.